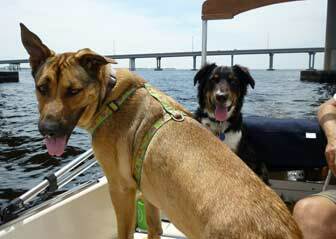 Motoring the Suncat under the bridge with puppies on guard duty. 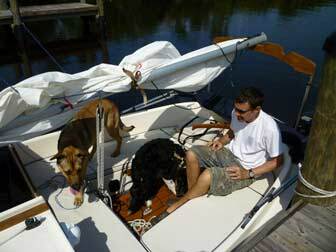 After a cold winter during which we had few opportunities to sail our Com-Pac Sun Cat, the Wily Conch, Sonja and I decided this was the week to do it, and I looked at the weather forecasts to pick a day. Friday looked great, with 10-15 knot winds and no chance of rain. Hard to beat, and sailing on a weekday means less of a crowd on the water. After confirming that our 5 hp Tohatsu 4-stroke was in the mood to run on Thursday, I dragged the boat out from under its cover Friday morning and found it to be completely coated with yellowish green pollen. A quick hose-down got it clean enough for my tastes, and I loaded aboard things like the teak cockpit grate, cockpit cushions, safety gear, etc., that does not live on the boat during storage. After a delay of many months since the last time we sailed this boat, I found myself wandering around my shed trying to figure out what I bring along to go out on the Sun Cat. I should probably make a real checklist, but instead imagined I was being stopped by a policeman on the water. That has happened enough times that I know what they will ask to see, so I made sure I had those things. 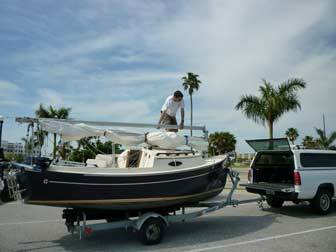 Next, I imagined that I was simply stopped out on the water, with no policeman or any other kind of help about. OK, so in addition to safety gear, I'm going to want some spare drinking water and tools. One of the best parts of sailing the Com-Pac Sun Cat: almost instant rigging and de-rigging. 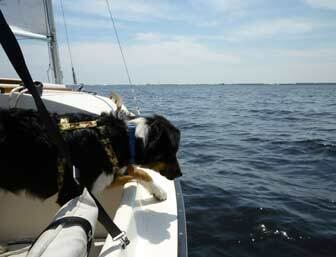 Just swing the mast up and snap the forestay tight, and you're ready to sail! Our initial plan was to launch here at our place on Shell Creek, but I was concerned that there was not quite enough water to launch the boat, and more concerned that the tide would not be high enough when we returned, and we would be unable to recover it at our boat ramp. Rather than fight the shallow waters, we towed the boat over to Laishley Park in Punta Gorda, which has a nice boat ramp and is much closer to good sailing water than our ramp. I prefer to launch here because it's a private ramp, no waiting for the wave of Flatsmasters Redfish Tournament guys, and no one minds if we have dogs at the boat ramp here, but there is definitely something to be said for launching directly into the harbor instead of having to motor down the creek and go under two low bridges, then motor some more to reach parts of the Peace River and upper Charlotte Harbor that are wide and deep enough for sailing. 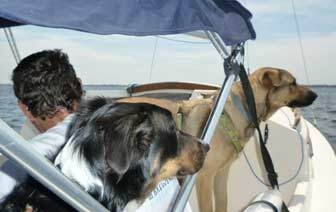 Sun Cat loaded up with Tom and two puppies and ready to go out sailing from the Laishley Park boat ramp dock. After waiting our turn to launch behind a Jet Ski and an aluminum fishing skiff, we slid the Wily Conch into the water and loaded up pups and passengers for our daysail. 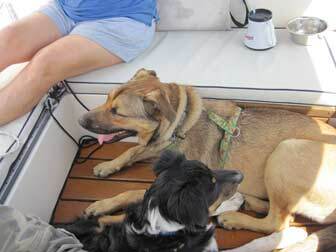 At 80 pounds Libby the Junkyard Dog is a bit big for small sailboats, but she really loves to come sailing with us. Luke the cowdog is still only about 45 lbs, and fits in the cockpit a bit better. Libby shows how much she appreciates being invited along with a big, wet, puppy kiss, which is the only kind she knows. Luke and Libby watching birds, considering chasing them. 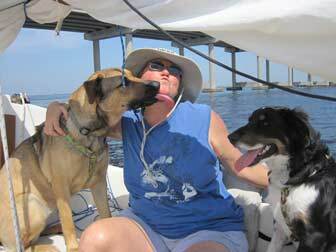 The puppies are always excited to go out in the boats, and sometimes express their excitement by jumping overboard in pursuit of hapless pelicans and sea gulls. Here they are watching some pelicans on the water, and Luke decides to experiment with taking his first step outside the cockpit, for which he got scolded. Luke takes an experimental step outside the cockpit, a puppy no-no. We bought the harnesses they are wearing so that I would have a way to get them back aboard if either one should go swimming, but I was hoping to avoid testing that technique. It is one thing to drag an 80 lb dog into a kayak like our Hobie Adventure Islands, but the Sun Cat has quite a bit more freeboard. We made it through the day without either dog abandoning ship. 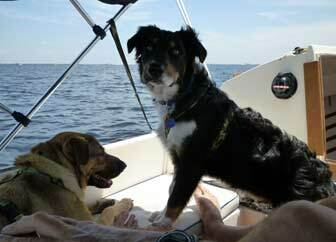 After a while, the relaxing pace of Sun Cat sailing sinks in with the dogs and they settle down to enjoy the ride. Luke and Libby relaxing on the teak grate in the cockpit sole. 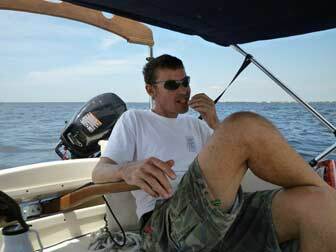 Relaxing and snacking on some Ritz Bits peanut butter crackers is my idea of a fun Sun Cat sail. I settled in to relax and just let the boat sail itself across the harbor, which it will do with minimal input if properly trimmed. Good time for a snack, so out came the box of Ritz Bits peanut butter crackers! 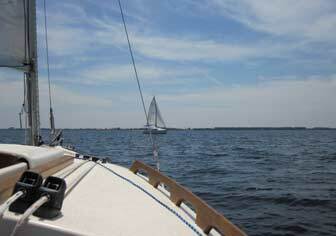 My relaxation was briefly interrupted when another sailboat came within range. A target! Another sailboat to race! As any sailor will tell you, two sailboats within sight of one another are racing! I decided to tack and pursue this Hunter 290, and was catching him for a short time before he noticed and adjusted course and sails to get away. We could hear them laughing at us, and I have to admit that trying to catch a 29 foot sloop with a 17 foot catboat is pretty funny!